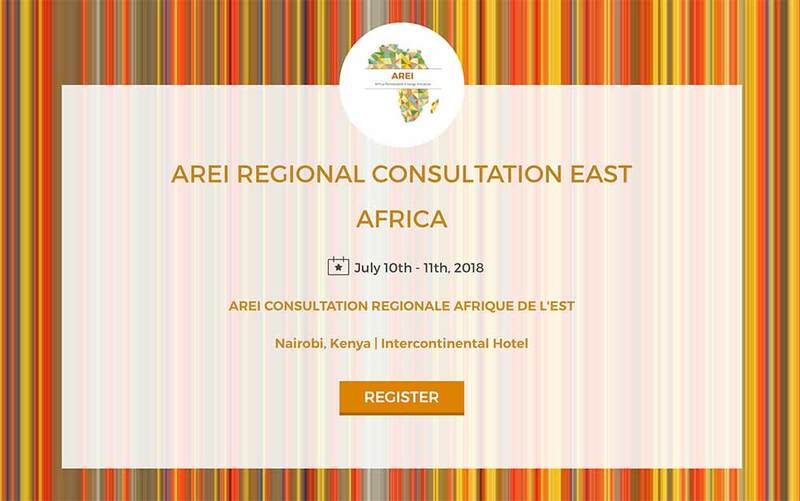 AREI is in the process of conducting Regional Consultations in each of the five African regions. A first consultation was held in N’djamena, Chad for Central Africa on 26-28 April 2018. The report from the meeting is available here. 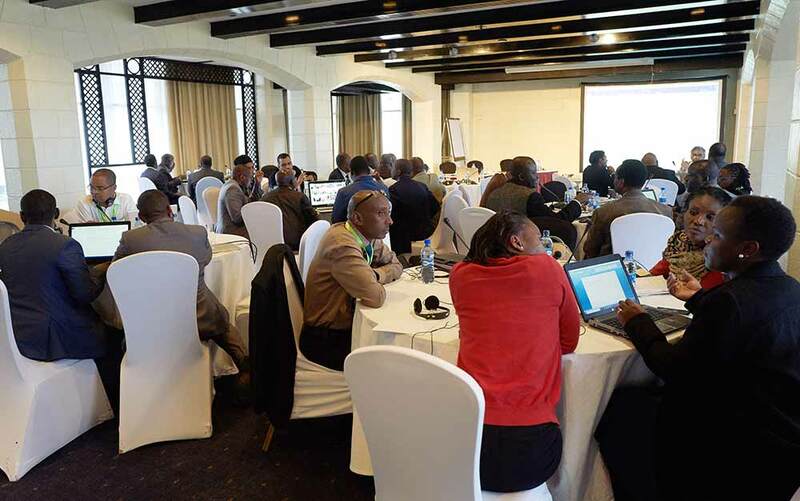 The second consultation was held in Nairobi, Kenya for the East Africa region on 10-11 July 2018. The report from the meeting is available here. Further information about the consultation is available on the special website set up for the event. 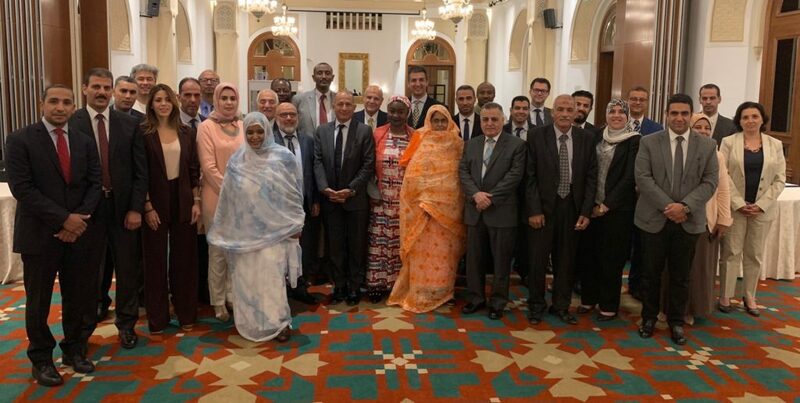 The third consultation was held in Cairo, Egypt for the North Africa region on 8-9 October 2018. Presentations from the meeting are available here. Reports, presentations and other information are available on the special website set up for the event. The report can also be downloaded here (English) (French). 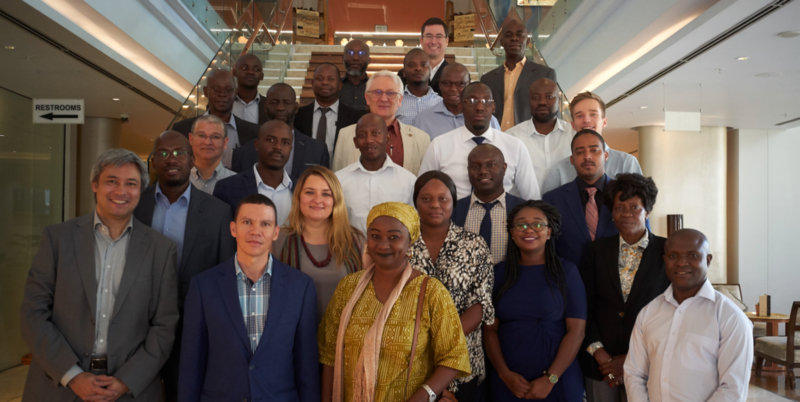 The fourth consultation was held in Windhoek, Namibia for the Southern Africa region on 29-30 November 2018. Presentations from the meeting are available here. Reports, presentations and other information are available on the special website set up for the event. The report is forthcoming. The dates for the Consultation for West Africa are not yet determined. 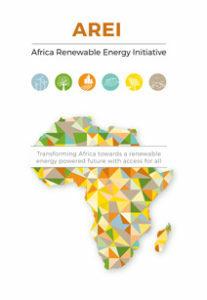 WHAT IS THE AFRICA RENEWABLE ENERGY INITIATIVE? The AREI Framework Document and Action Plan provide the basis and strategic direction for the Africa Renewable Energy Initiative. Communications issued by H.E. 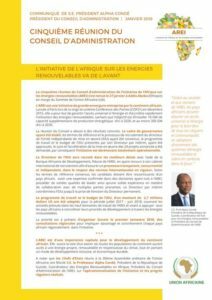 Professor Alpha Condé, President of the Republic of Guinea, Coordinator of renewable energies for Africa and Chair of the AREI Board. The sixth Board meeting was held in Nouakchott, Mauritania on 1 July 2018 and unanimously agreed on the selection of the permanent Director of the Independent Delivery Unit, the implementing agency of the Initiative. 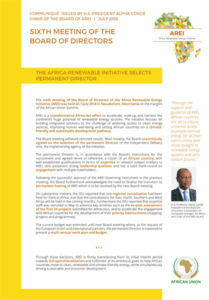 The permanent Director is, in accordance with the Board’s instructions for the recruitment and agreed terms of reference, a citizen of an African country, with well-established qualifications in terms of expertise in relevant subject matters to AREI, who possesses strong leadership qualities and has a solid track-record on engagement with multiple stakeholders. Following the successful approval of the AREI Governing Instrument in the previous meeting, the Board furthermore acknowledged the need to finalise the transition to permanent hosting of AREI which is to be resolved by the next Board meeting. 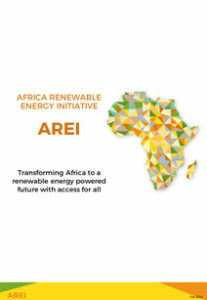 The fifth meeting of the Board of Directors of the Africa Renewable Energy Initiative (AREI) was held on 27 January in Addis Ababa, Ethiopia on the margins of the African Union Summit. Help achieve sustainable development, enhanced well-being, and sound economic development by ensuring universal access to sufficient amounts of clean, appropriate and affordable energy. Help African countries leapfrog to renewable energy systems that support their low-carbon development strategies while enhancing economic and energy security. 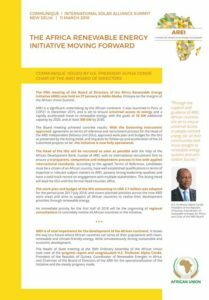 The immediate establishment phase (2015 to mid-2016): Formal initiation of the AREI activities, including resource mobilisation, establishment of the governance and management structure and identification of Phase I projects that will be in the pipeline by mid-2016. 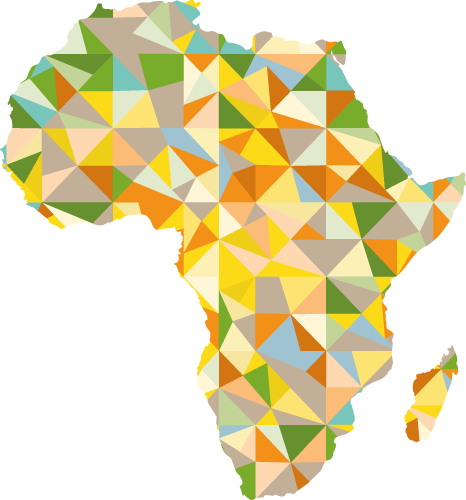 Phase I (2016-2020): In cooperation with bilateral and global partners, assessments, preparations and critical enabling activities at the continental African level as well as in a number of pioneering countries. Achievement of at least 10 GW new and additional generation capacity. Phase II (2020-2030): Ambitious, full-scale roll-out of nationally determined policies, programmes and incentives as initiated under Phase I. Continuous project identifications, assessments and revisions for further scaling up to at least 300 GW new and additional generation capacity of renewable energy. Contribute to achieving sustainable development in Africa by scaling up and accelerating the deployment and funding of renewable energy in Africa. Address the entire African continent and benefit all African countries. Boost intra-regional and international cooperation and promote and support only those activities and projects that are agreed by the countries concerned and impacted. Promote all kinds of renewable energy technologies – in particular solar; wind; pico-, micro-, small- and medium-scale hydro; modern biomass; geothermal; and marine – provided they are socially and environmentally appropriate, gender-sensitive and in line with these guiding principles. Promote the full range of renewable electricity applications, from grid-connected to mini-grids to small stand-alone systems, as well as other forms of energy, with particular consideration being paid to applications that meet the needs of poor people. The AREI Action plan identifies specific activities under five Core Work Areas and four Cross-cutting Work Areas, all of which complement and build on work by other relevant stakeholders. These range from helping interested governments strengthen policy, regulatory, support and incentives frameworks to providing project development and support that ends with the financing of RE projects. A detailed Action Plan describes these nine elements in detail. 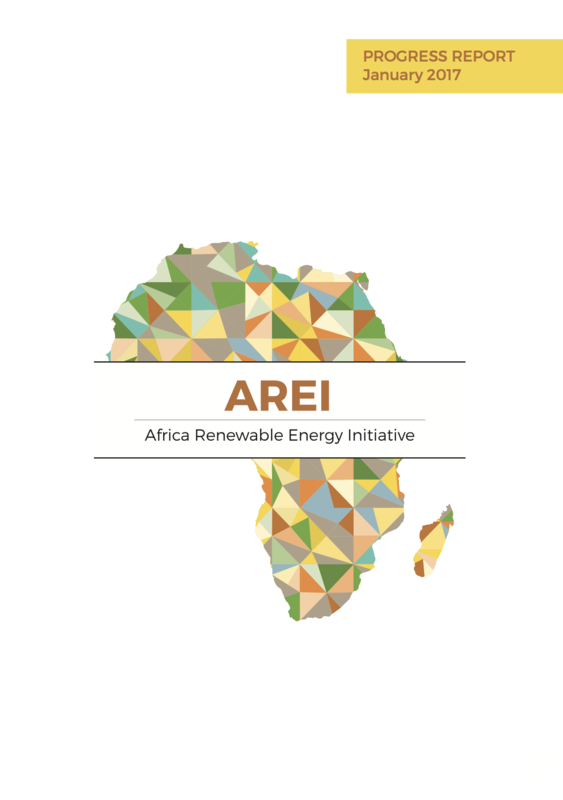 The AREI recognizes that the scale of African energy challenges is enormous, but so are the opportunities. Transformational change is both needed and possible, and must be stimulated by truly collaborative international efforts and goodwill. 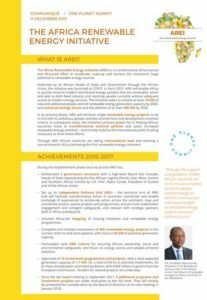 By fostering partnerships, bringing together existing initiatives, and mobilizing new international support for secure, distributed and people-oriented energy systems of the future, the Initiative will help African countries gain access to cleaner energy to drive their development and prosperity. 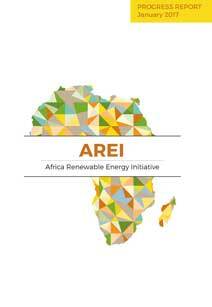 The AREI envisions smart, distributed energy systems that can handle a mix of renewable energy generation. With a highly diversified ownership base compared to that of conventional, centralized energy systems, a vast number of households, communities, cooperatives, small and medium-sized enterprises, as well as larger companies, become both producers and consumers of electricity. This will enable Africa to leapfrog to the energy systems of the future. The Initiative highlights the fact that as well as ensuring appropriate electricity access for households and families, access needs to be sufficient to also drive the productive sectors in both local and national contexts for job creation, economic development and increased resilience. This includes addressing the needs of small-scale farming and micro, small- and medium-scale enterprises in terms of both quantity and quality of access, and entails a vision of electricity access beyond the bare minimum requirements for households. For poor people, increased access to energy means a potential for improved livelihoods. The Initiative will therefore promote unprecedented efforts to reach populations currently off national grids. It will plan for expanded access to electricity for social services as African societies develop social security provisions and other means of improving welfare for their populations over the coming decades. 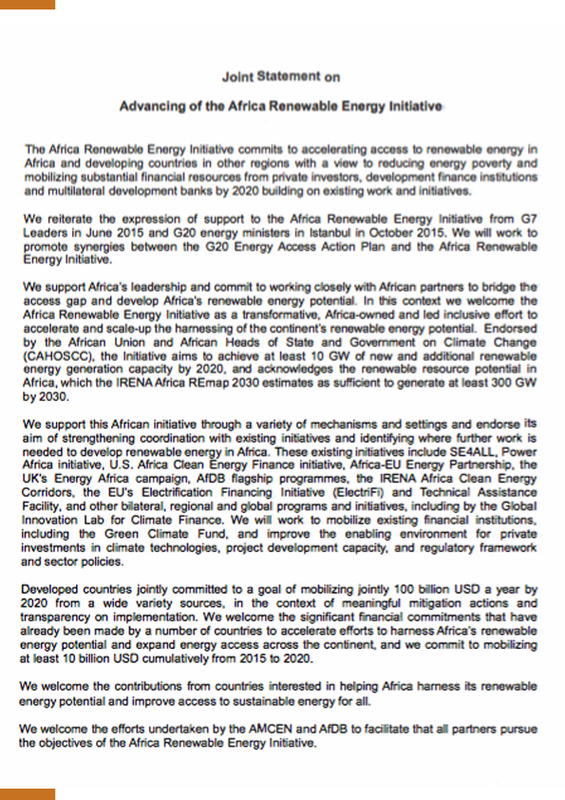 In a Joint Statement of support to advance the Africa Renewable Energy Initiative, Canada, France, Germany, Italy, Japan, United States of America, United Kingdom, EU and Sweden committed on 7 Dec 2015 to mobilize at least USD 10 billion USD cumulatively from 2015-2020. The Netherlands later joined the group. This meeting gathered the countries committing to USD 10 bn in support of AREI at COP21 as well as AREI Board members and IDU, to deliberate how the contributions could be provided in line with AREI principles and criteria. The AREI Progress Report shows what has been achieved by the AREI and its Drafting Team/interim Independent Delivery Unit during 2016. Click to download the AREI Brochure in pdf format. 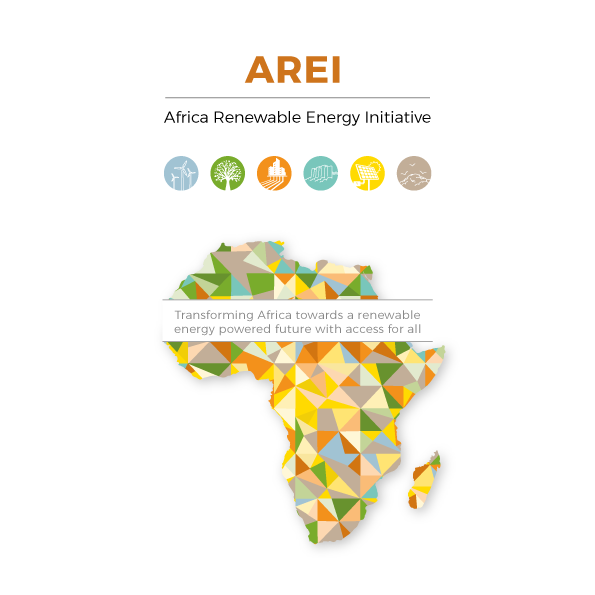 Click to download the AREI Summary in pdf format. The AREI framework documents describes the initiative in detail, including context, goals and guidelines, activity clusters, elements of the implementation strategy and governance and management. It has been endorsed by the Commission of African Heads of State and Government on Climate Change (CAHOSCC) and the African Union Summit and constitutes the basis for the initiative. The AREI Action Plan outlines concrete actions for both the first 12 months Establishment Phase and the AREI Phase I (2017-2020). The Establishment phase include operationalisation of governance and management structures, engagement with African countries and institutions, resource mobilisation, initial mapping of relevant programmes and initiatives, and consideration of initial programmes and projects to be supported. The AREI Phase I outlines activities under 5 Core Work Areas and 4 Cross-cutting Work Areas. The AREI Action Plan is a living document that will continuously evolve as the work advances. 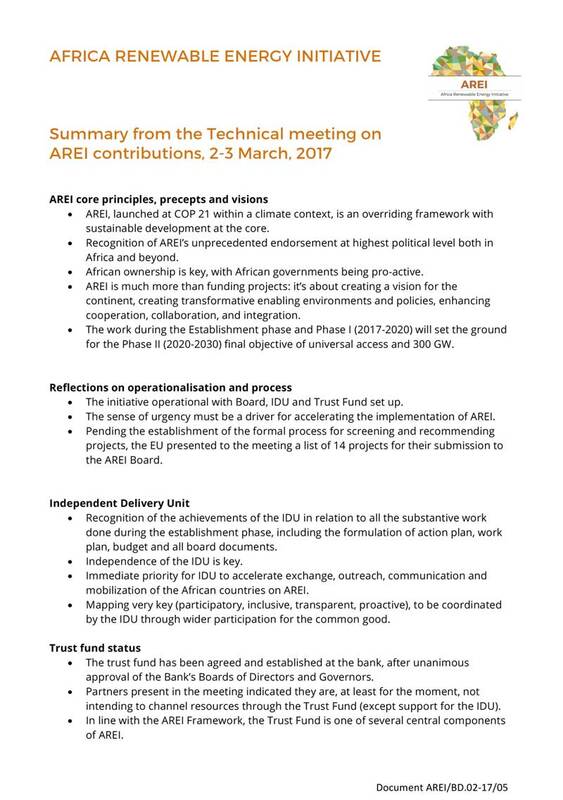 This document presents the AREI Criteria to be applied for assessment of attribution and eligibility/prioritization of funding. 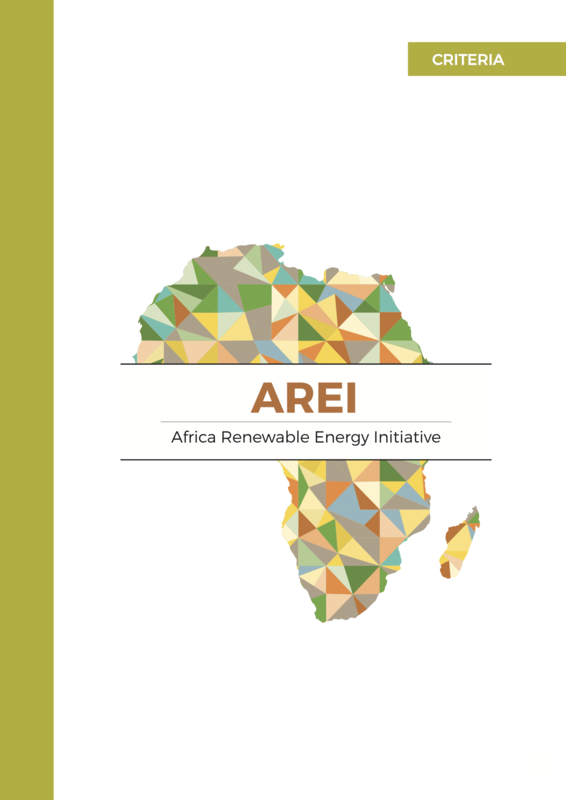 The document will help guide determination of what programmes and project can be considered under AREI, and help prioritisation of support and funding. 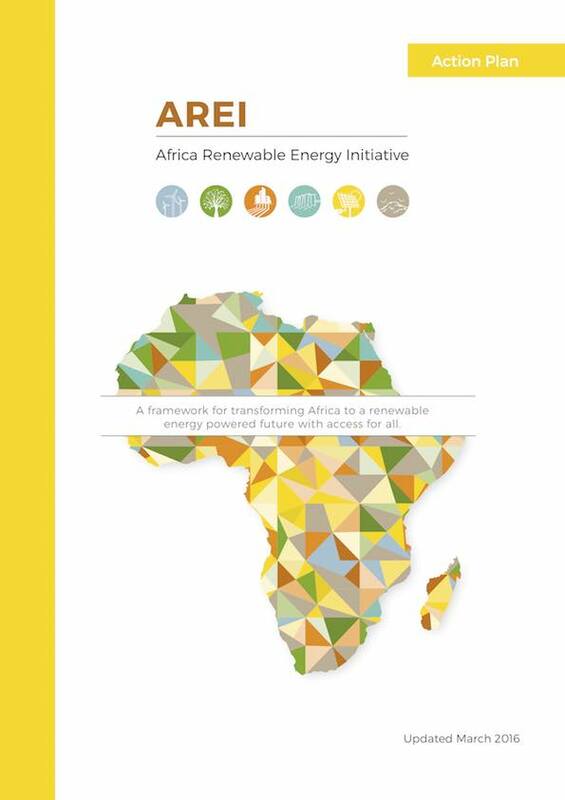 The document was presented and discussed at the African Union commissioned Technical Working Group on Renewable Energy meeting in Cairo 11-12 July 2016, and has been further refined based on input from multiple stakeholders.